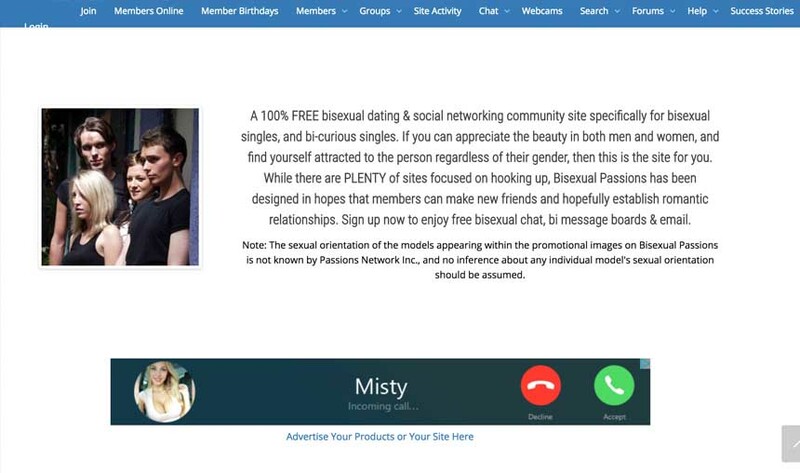 Bisexual Passions offer users on its platform a double pack of service as it functions as both a social platform and a bisexual dating site which means you can enjoy bisexual chats with other bisexual personals, meet bisexual men and bisexual women that are interested in bisexual dating, or find bi curious and bi singles living around you for a hook-up. The registration process is short and stress free and you can immediately start to mingle with other bisexual singles on the site ones you build a comprehensive profile and add your photos. It is free to use and access all features on this dating site and it has no hidden charges. However, if you upgrade to the “Network Wide Access” package, you will be able to add other sites of Passions Network to your account and enjoy unrestricted access to all of them. The site permits visitors to register either with their Facebook account or directly with a specified username and password. To join, the following are required: username, email address, password, and a security question. After signing up, you will be able to build or modify your profile, and add your photos. With your full profile, you can start to explore the site. You can browse through the list of available members, read their profile, view their photos, and communicate with anyone you are interested in. It is both a dating site and a social platform and caters for all bisexual personals irrespective of what they seek. It is 100% free to use with no hidden charges. It is not a perfect site for bisexual dating and it does not have any dedicated service to help members find partners. Since it is a free site, there may be several fake accounts and members should be careful and vigilant. Bisexual Passions is just another site from Passions Network that operates 100s of other sites. It is free to join and it is free to use all its features as well. Since the site is a social platform as well as a community for bisexual dating, it has a large member-base of different bisexual personals that are active and ready to have fun with interested bisexual singles. That means you are definitely going to find people of like passion and something that will excite you on the site. It is common to expect less from websites that are free to use but surprisingly, Bisexual Passions offers even great features that you wouldn’t find on most bisexual dating sites that offer paid membership plans. Bisexual Passions caters for bi curious, bi singles and bi couples, so if you are a bisexual man or bisexual woman that wants to have fun and meet others like you from other parts of the world, you should check this site out. You can create a profile, add your photos, view other members’ profile and check their photos. You can initiate conversations with members and enjoy bisexual chats with them. You can enjoy text chat, audio chat and webcam chat with other members in the chat room. You can make advanced searches on members on the site with the search tool. There are over 1200 groups to join for discussions where you get to meet people that shares similar interests with you. You can join forums, read success stories, and check members’ birthdays. It is 100% free to use!